A garlicky, hot and sour bean stew. 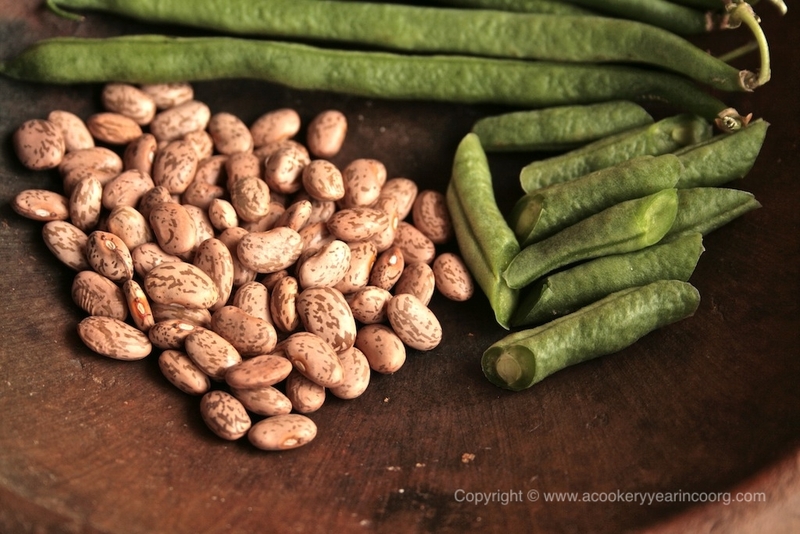 Put the soaked or fresh beans in a deep pan along with the garlic, cover with 1’’ of water and bring to a boil. Skim off any froth that rises. When 3/4 cooked, drop in the green beans and cook until they are just tender. Stir in the remaining spices and salt. Cover and set aside. Heat the oil and sputter the mustard seed, followed by the curry leaves and garlic. When the garlic has begun to brown, add the green chillis and onions. Sauté until the onions are soft and beginning to brown. Add to the cooked beans and bring to a gentle simmer.cook for 4 – 5 minutes. Add the ground coconut paste to the simmering beans and cook for 5 minutes. Remove and eat with steamed or ghee rice.